Everybody that knows me will be well aware that I believe AutoCAD Civil 3D is probably one of the best pieces of design software in its class on the market at the moment, however, even through my slightly (just ever so slightly) rose tinted specs, there are some functions that could do with sorting out. With the advent of BIM for Infrastructure and the furore surrounding all things BIM, the ability to extract specific information and reports, although adequate at this moment in time, it is definitely not easy. To interrogate any large complex civil models on the fly is definitely not for the faint hearted! Fear not as Cadline has teamed up with 3AM Solutions (the brains behind Civil View) to provide you with a tool that will do just that and more, ProjectExplorer is such a cool tool that makes it so easy to explore validate and report on your project design. Below is some information about ProjectExplorer, as you can see it fully integrates in the ribbon of various versions of Civil 3D. If you want further information just give me a shout. 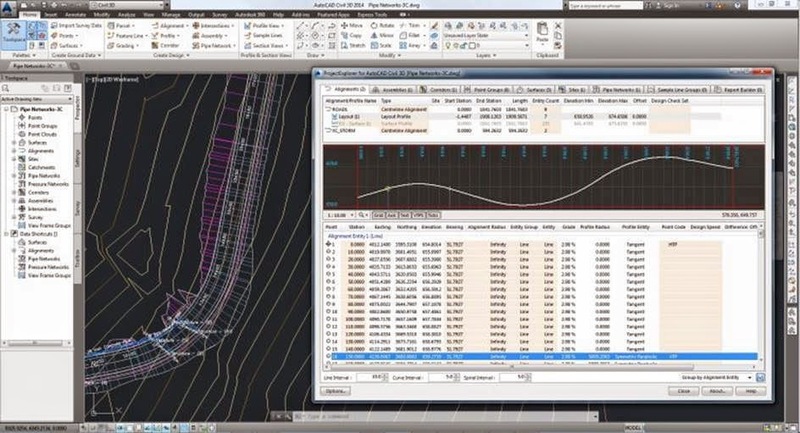 Featuring a powerful, user-configurable report generator - as well as a unique, continually updated on-screen report view and a range of integrated design validation tools - ProjectExplorer really is the Ultimate Companion for AutoCAD Civil 3D. Explore your AutoCAD Civil 3D model in ways you never dreamed possible. Enjoy an unprecedented level of insight into almost every facet of your design from a single panel. Introduces a unique new concept to AutoCAD Civil 3D - live, dynamic, on-screen geometric reporting, facilitating a much deeper understanding of the civil model and the geometric relationships within. Features a range of dedicated profile and section viewers which provide live graphical feedback from Alignment Profiles, Sample Lines, Assemblies and Pipe Networks. Features fully dynamic station (chainage) sampling intervals for alignments and profiles. Key relationships with other alignments, profiles, surfaces, and feature lines may be continuously monitored. Features a growing range of design validation and geometric filtering tools which effortlessly reveal areas of the model that may not comply with specified design goals. Features a unique template-driven report generator which puts you in full control of the formatting and content of every report. User-configurable report headers and images may optionally be applied. Use the Quick Report feature to output detailed reports from individual objects, or use Report Builder to establish report content from selection sets which are saved in the drawing for later re-use. Supports the generation of reports in a wide range of popular file formats including text files, CSV files, HTML files, and DOCX files.